At first, she said, she could not make sense of the tiny geometric designs in both fabrics. Upon closer examination of the band from all angles, she said, she realized she was looking at Kufic script. The words Allah and Ali appeared in the silk found in Boat Grave 36 and in many other graves — and, most intriguing, the word Allah could be seen when reflected in a mirror. The same patterns have been found in mosaic grave monuments in Central Asia. 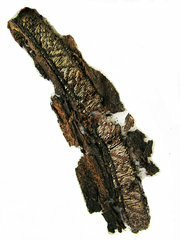 Dr. Larsson has long noted the prevalence of silk from Asia in Scandinavian Viking graves. But the analysis of these materials, the weaving techniques and design indicated a combination of Persian and Central Asian origins. An image taken from the analysis of the Kufic characters on bands found in graves in Sweden. “A giddying thought is that the bands, as well as the costumes, were produced west of what was the Muslim heartland,” she said. The evidence, she added, supported the theory that the Viking settlements in the Malar Valley of Sweden were, in fact, a western outpost of the Silk Road that stretched through Russia to silk-producing centers east of the Caspian Sea. It is well known that the Vikings traded with the Arab world, and archaeologists have found plenty of Arab coins in Viking settlements. The trade lasted 150 years, beginning in the first half of the ninth century. But Dr. Larsson said that the silk and other artifacts found in the Viking graves suggested not just trade or plundering — but a deeper cultural exchange and shared ideas. Did the Vikings know the words were in the fabric? In addition to the objects found, large portions of the woman’s skeleton were found preserved. “She has been following me for years,” Dr. Larsson said of the woman found in Boat Grave 36, which was reconstructed for the exhibition. “She had so much silk in her grave that she has fascinated me,” she added during a tour of the show at Enkopings Museum, northwest of Stockholm. There is evidence to support this in Viking mythology, in 12th-century historical texts from Scandinavia and in the writings of Ibn Fadlan, a traveler from Baghdad who chronicled a Viking boat burial from Eastern Russia at the beginning of the 10th century, Dr. Larsson said. The next stage of the project includes the DNA analysis of human remains found in Viking graves, including the skeleton in Boat Grave 36. The results are expected in February 2018. “When we get the results from the DNA analysis, I think we will be able to see that some of them have a Central Asian heritage,” Dr. Larsson said. Not everyone accepted Dr. Larsson’s interpretation. She said she had been interviewed by an extreme right-wing publication questioning the exhibition and her reading of the material. Viking symbols such as the Tyr rune are used by neo-Nazi groups to advance a myth of ethnic purity, something that many Viking re-enactment groups have said they do not want to be associated with. 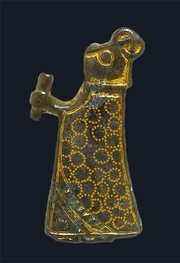 A viking figurine from Bornholm, Denmark, with the typical circular motifs found in silk fabric from Central Asia. 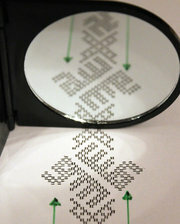 Similar patterns were found in the graves in Sweden. But Roland Olsson, a retired social studies teacher and history expert from Uppsala, said he was not surprised by the questions raised by the exhibition. Christian Skoldborg, a spokesman for Fenris, a Viking re-enactment group that travels to markets all over Europe to sell crafts and show how Vikings lived, said the thought of a deeper cultural exchange between the Vikings and the Arab world was not such a shock. “This notion that Vikings were a pure race — that picture is something we need to wash away,” he said. 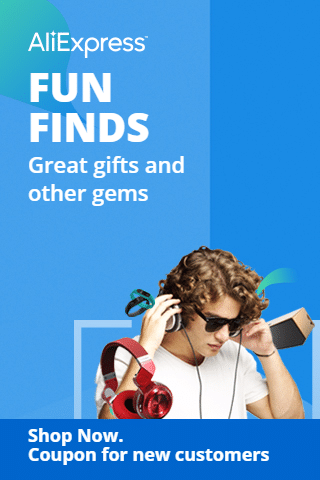 “There are so many artifacts that show Arabic writing in the bands. It is very likely that they came here and lived,” said Mr. Skoldborg, who works as a forger in a smith near Gothenburg. Solveig von Malmborg, who belongs to the network Vikings Against Racism, which tries to combat the extreme right’s appropriation of Viking heritage, said Viking enthusiasts were often mistaken for racists and Nazis. At the entrance of the exhibition in Enkoping, an introductory text tells visitors that there are fanciful genres claiming to know the truth about the Vikings. How does such a historical description shape our identity? “I think one needs to pause before saying that everything is so Swedish,” Dr. Larsson said.